Luc(as) de Groot graduated from the Royal Academy of Arts (KABK) in The Hague, the Netherlands, under typography teacher Gerrit Noordzij. For four years, he worked at the Amsterdam design agency BRS Premsela Vonk, now called Eden Design. In 1993 he moved to Berlin, Germany, to become typographic director at the renowned company MetaDesign. At MetaDesign, Luc(as) worked on a large number of corporate identity projects, including the design of logos, magazine concepts and client-specific type designs. 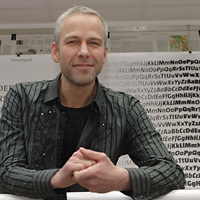 He reworked Erik Spiekermann's FF Meta (which became MetaPlus) and during his evenings managed to finish the largest digital type family ever - which was released as Thesis in 1994. In 1997 Luc(as) de Groot left MetaDesign to start up FontFabrik, a company that developed custom type and logos, as well as offering typographic consultancy. In 2000 the LucasFonts typefoundry was established to market and distribute Luc(as)' typefaces. Apart from working on the LucasFonts retail fonts, Luc(as) continues to work for editorial, corporate and non-profit sectors. Clients he has worked for include Sun Microsystems, Heineken (with Eden Design), Siemens, Miele and Bell South, as well as the newspapers Le Monde, Der Spiegel, Taz, Jungle World and Metro. Luc(as)' skills have been widely recognized within the international design community. Since the introduction of Microsoft’s Windows Vista system, two of his fonts have appeared on PC screens the world over as part of the ClearType Font Collection. Luc(as) designed both Consolas, the successor to Courier, and Calibri, the new default font of MS Word.